Nonprofits, social enterprises benefit with debit/credit card donations and purchases; Ventureneer webinar shows benefits, pitfalls of plastic payments. It's a cost of doing business in the 21st century, even for nonprofits and social enterprises: Credit/debit card fees. Every organization, whether for-profit or nonprofit, must accept payment-by-plastic or lose potential donors and customers. But, as with all costs, they can be minimized. Credit Cards: Can't Live With 'Em, Can't Live Without 'Em: A High-Level Overview for Nonprofits, a free webinar from Ventureneer, will give nonprofit executives and entrepreneurs the information they need to select the right card, the right way to process the card, and the best ways to make it available to donors and customers. "Credit and debit cards can be tricky and, if you're not careful, costly to use," says Geri Stengel, founder of Ventureneer. "This webinar will show nonprofits how to use them wisely, well, and at the lowest cost." The free online seminar will be taught by Marc Halpert, a veteran of money management systems. Marc W. Halpert is Managing Partner, Your Best Interest LLC. Since leaving the corporate world eight years ago, Halpert has started two companies offering specialized, paperless electronic payment services to optimize cash flow and speed of collections. The webinar will be held Wednesday, July 21, from 3 - 4pm. ET. Anyone concerned with bringing in donations or easing customer interface will benefit from this class. That includes marketing, development, web design, bookkeeping, accounting and finance as well as entrepreneurs. For more information, visit Ventureneer's website. Geri is founder of Ventureneer, an online education and peer support service. An adjunct professor at The New School, she honed her online experience at companies like Dow Jones and Physicians’ Online. Geri co-founded the Women’s Leadership Exchange and is president of Stengel Solutions, a consulting service for social-impact organizations. 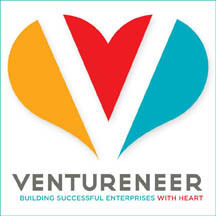 Ventureneer.com provides nonprofit and small business advice as well as entrepreneurial and nonprofit training through a new approach to learning: a blend of traditional, formal instruction with informal, peer learning that takes advantage of Web 2.0 technology to capture and share knowledge. Ventureneer's customized blogs, virtual classes, peer-to-peer learning, coaching, web events, and articles help entrepreneurs make faster, better decisions for their enterprises.